A summer camp in Saint John is exposing young newcomers to the tools they would need to become welders. Aisha Kuvatova steadies a sheet of metal as her partner lowers a welding torch spitting out white-hot fire. Sparks fly and a blinding light glows, causing Kuvatova's face to light up. "In my country, there are no girls working on this job," said the 17-year-old, who is originally from Tajikistan. "We don't have this program." She fled her home country with her family to live in Turkey but was later forced to leave again following her father's death. Kuvatova is one of about 20 newcomers between the ages of 11 and 17 attending the welding and blacksmithing camp taking place at Harbour View High School. Most of the children and teenagers were refugees, hailing from Africa and the Middle East and now living in Saint John. 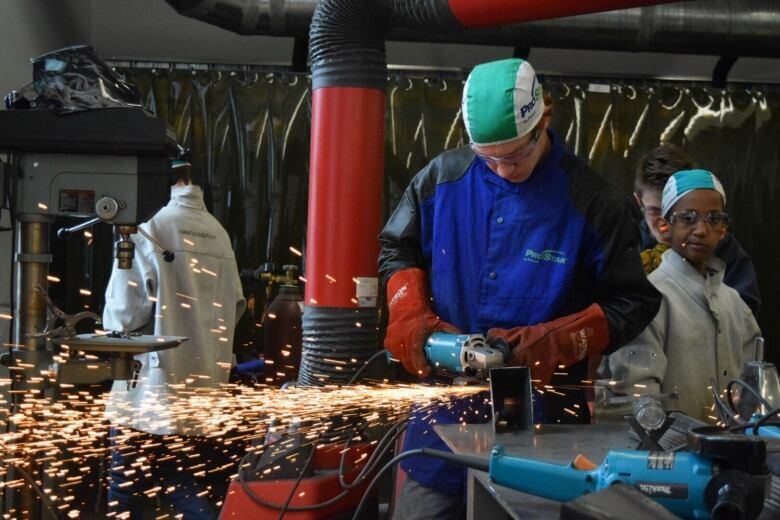 The Mind over Metal camp is funded by the Canadian Welding Bureau, an industry-supported organization that works to spark young people's interest in the trades. The concept of the week-long workshop began in Edmonton in 2013. Harbour View welding teacher Andrew Clarke heard about it and saw an opportunity to bring it to Saint John. "They can come in, they can learn what welding is all about, get a try for it, see what it's all about," he said. Trade industries in New Brunswick have previously reported that new employees, "lacked the skills required to take on the duties of the workplace." The industry group forecasts a shortage of welders across the country by 2020, Clarke said. He hopes camps like this one can help solve both those problems. While this week's welding camp is for newcomers, Clarke said other camps are directed at children at risk and Indigenous youth. "Welders are great-paying jobs," he said. "It's a chance for the kids to get in there … really be successful." There's hope the camps could also help bring more girls and women into the field. Feyrous Veyrous, 14, used a plasma cutter to cut hearts out of a sheet of metal for a name tag she created. "I thought only boys can do it, but it's so cool," she said. "You cannot give up." When Kuvatova first heard about the camp through the local YMCA, she said it was in relation to her brother. When Clarke told her she was invited to join as well, she was ecstatic. "I was like, 'I can come? I am a girl!" A smile crept across Kuvatova's face as she showed off a metal log with a small axe fused to it — a creation she designed herself. "Every day was different enjoyment for me," she said. "Every day I was waking up at 8 a.m. and telling my mom, 'Oh, I should be going to the bus because we will be doing something new today.'" While the work is hard, welding is a trade she's considering pursuing, now that she knows she can. "My father passed away. I think he will see me like this and he'll be happy."